Eat yourself thin with this informative guide to eating the right food to keep weight off and stay thin. 'Eating yourself thin' might sound odd when it's eating that made you overweight in the first place. It's not the process of eating that does the harm, however, but eating too much of the wrong kind of foods. Once you start focusing on foods that make your digestive, hormonal and cardiovascular systems work at optimum level, losing weight and keeping it off long term needn't be an uphill struggle. The key to getting thin, and staying thin, is restoring balance to key hormones in your body. A diet of low-GI foods will deliver this. You don't need to obsess about calories, and you might even find yourself eating more than you did previously. The important thing is to change the types of food you eat, and change them for good. There are many different reasons for being overweight - from post-pregnancy pounds to stress - and you will find here lists of foods that are particularly useful in solving any problems you may be experiencing. So follow the menu planners and these delicious recipes to change the way you eat, and the way you look, forever. 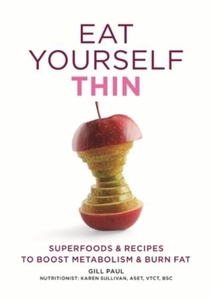 Eat Yourself Thin includes... Part I Happy Superfoods Superfoods What's your problem? Putting it all together Part II Thin Recipes Breakfast Snacks Lunch Dinner Desserts ...And much much more!